Date Night gives you a double dose of fun tonight with fresh beer and fresh pasta. We find ourselves on the Westside again in a restaurant we have not visited for awhile. 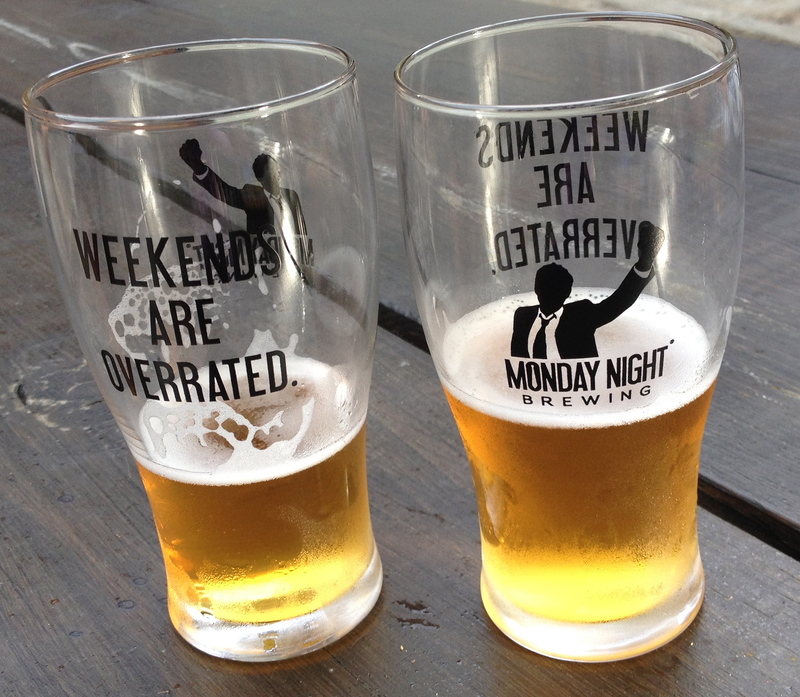 For our pre-dinner beers, we park at Osteria del Figo and start walking, and 7/10 mile later, we are at Monday Night Brewing. Monday Night opened their tasting area in January, and it’s a good one. It’s nice and big and can handle a lot of people. We are meeting a group of friends and get one of the long outdoor tables in the Monday Night beer garden. For $10, you get a glass and six “tastes” of beer. Fu Manbrew: This is a Belgian-style wit beer, which is normally my favorite, but this one has a strong ginger taste. If they cut back the ginger by about half, I would like this beer a lot more. Eye Patch IPA: It’s hoppy, but not too hoppy. This is a good IPA. Blind Pirate Double IPA: Make mine a double! And at 8.2% ABV, this one will get you there twice as fast. Drafty Kilt Scotch Ale: This is my favorite Monday Night beer as I like Scotches. Nice and malty with hints of cherry and chocolate. 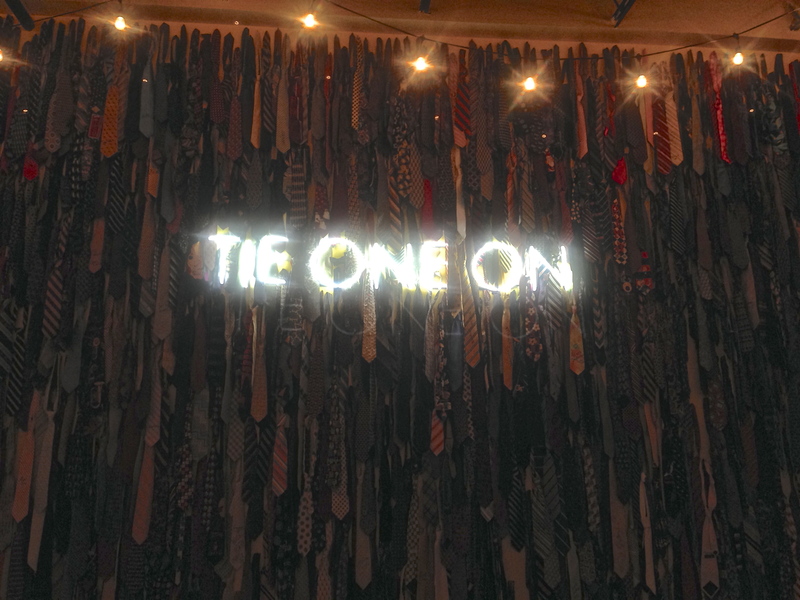 There are four of my ties on this wall. All good things must come to an end, and so does the tasting at Monday Night. 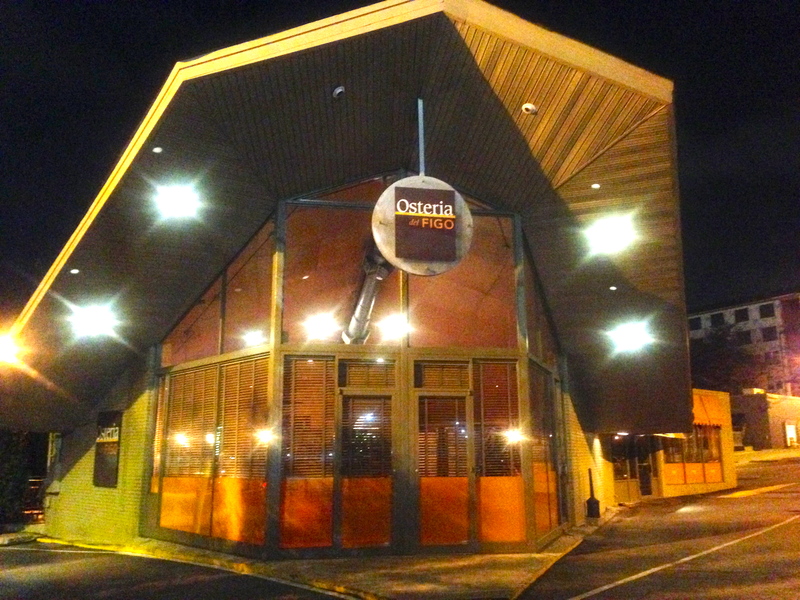 This gives us a chance to walk back to Osteria del Figo, which is located in the same area as Bacchanalia, JCT Kitchen, and Taqueria del Sol, just to name three good ones. Ormsby’s and Yeah Burger are right next door, so you won’t run out of places to eat around here. We draft our dear friends (and frequent Date Night double daters) Randy and Claudia for tonight’s festivities. We are hungry. We order at the counter and find a table outside to enjoy the last of our warm nights before fall shows up. At Figo you pick from over 25 house-made pastas and then top them with a choice of over 15 sauces. The price depends on what pasta and sauces you choose. You can also order from a list of “Figo Favorites”, where they pick the sauce and pasta. The combinations are endless. 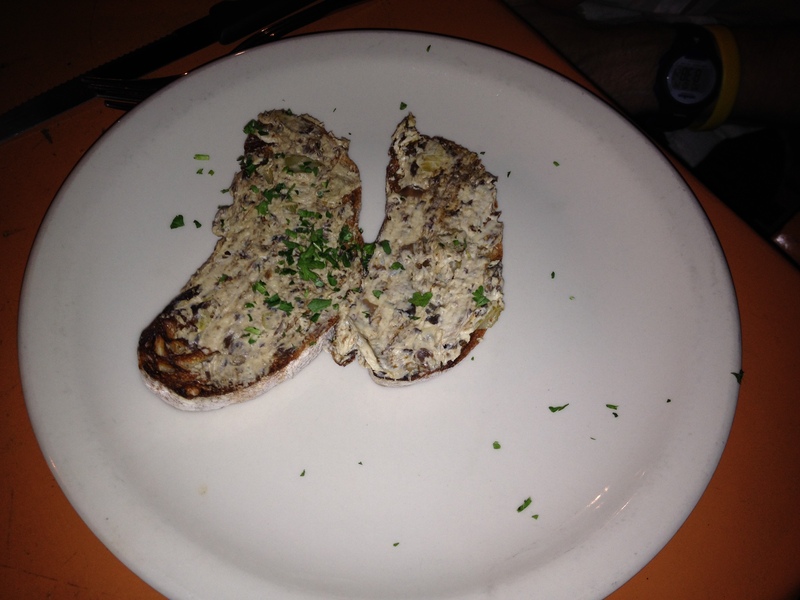 We order the tartufo, which is mushrooms, asparagus, wine and truffle oil on toasted ciabatta. The plate makes the portion size look small, but there was plenty for the two of us to share. Randy and Claudia “go green” with salads. 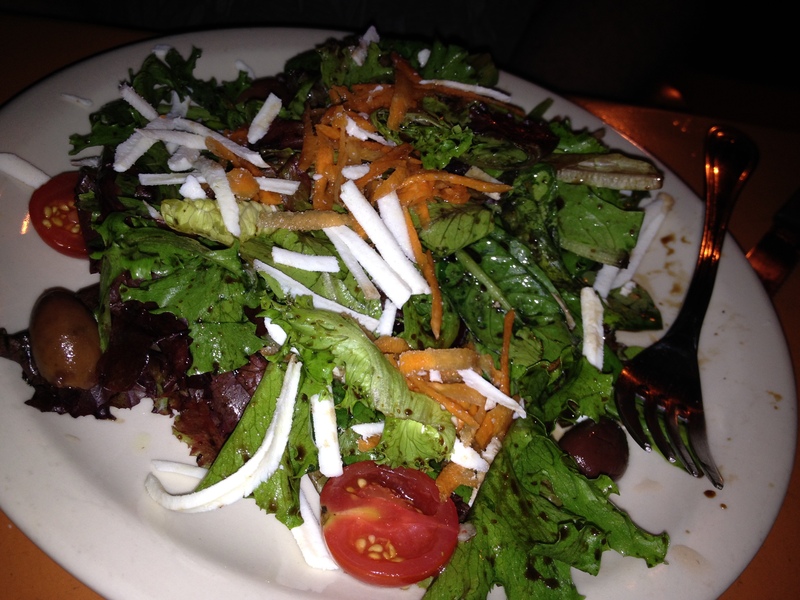 The misti salad has greens, tomato, carrots, and olives with shredded ricotta on top of a balsamic dressing. Learn Italian: Insalata di Spinaci, translates to “spinach salad”. 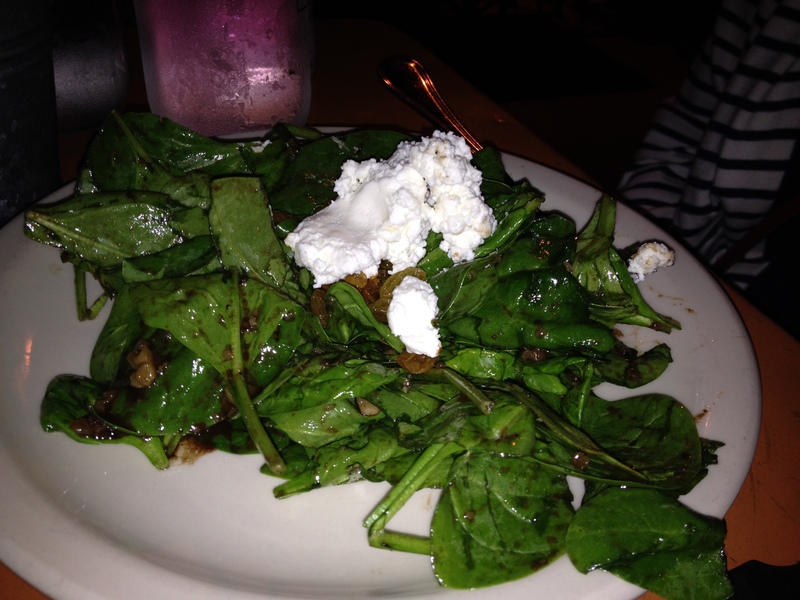 The spinach salad has goat cheese and raisins. There is a honey balsamic dressing on the greens. These salads must have been good because the plates were quickly empty. So how did we combine all of those pasta choices? 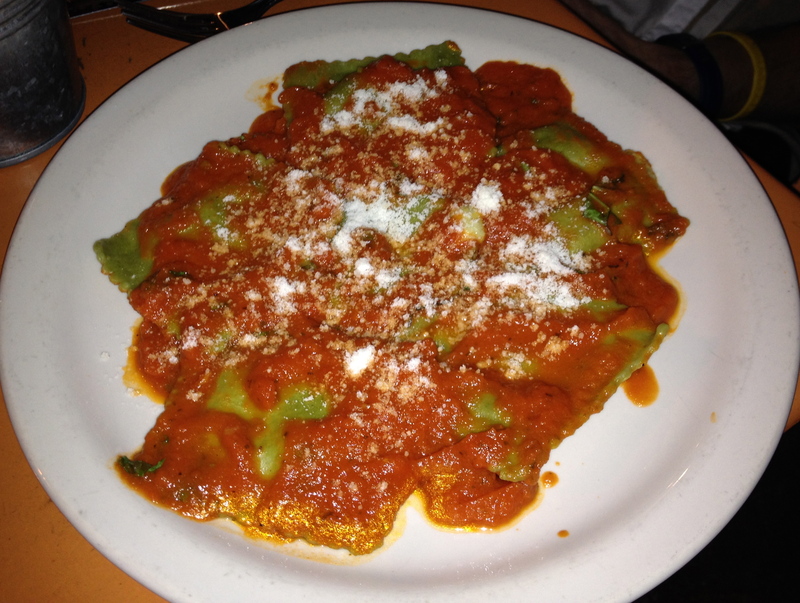 Eve goes with the artichoke ravioli covered in the pomodoro sauce. She was hoping for more chunks of tomato in her sauce, but she enjoyed it just the same. Claudia and I order almost the same thing, so we will only show one of the dishes. 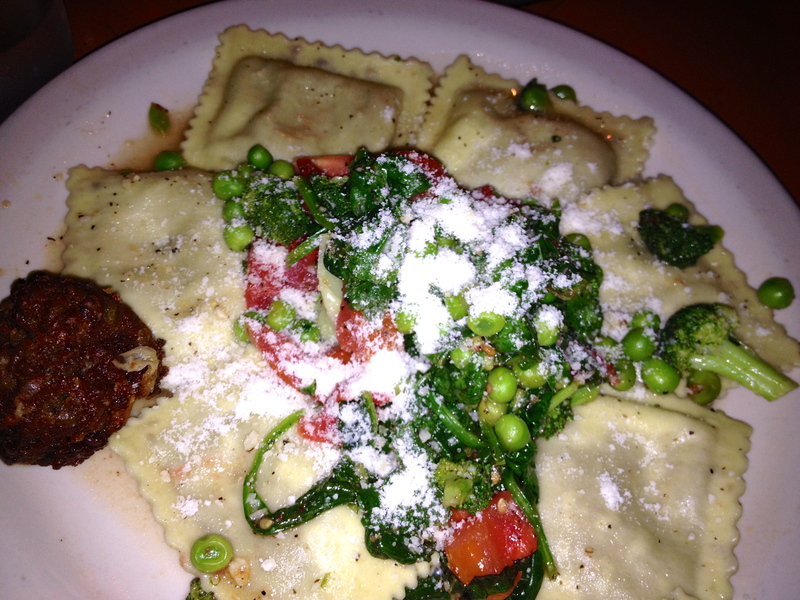 I go for the sausage-apple ravioli with a primavera sauce. This dish is excellent. The sauce is full of broccoli, peas and spinach, so I got the chunks of stuff that Eve wanted on hers. I got a side order of a meatball, which was a little skimpy, but tasty. I should have ordered two. We have one more dish to show. Randy orders the lasagne, which looks great. Somehow he has room for the entire thing. We all walk out of Figo feeling full, and feeling good about the food and the brewery down the street. 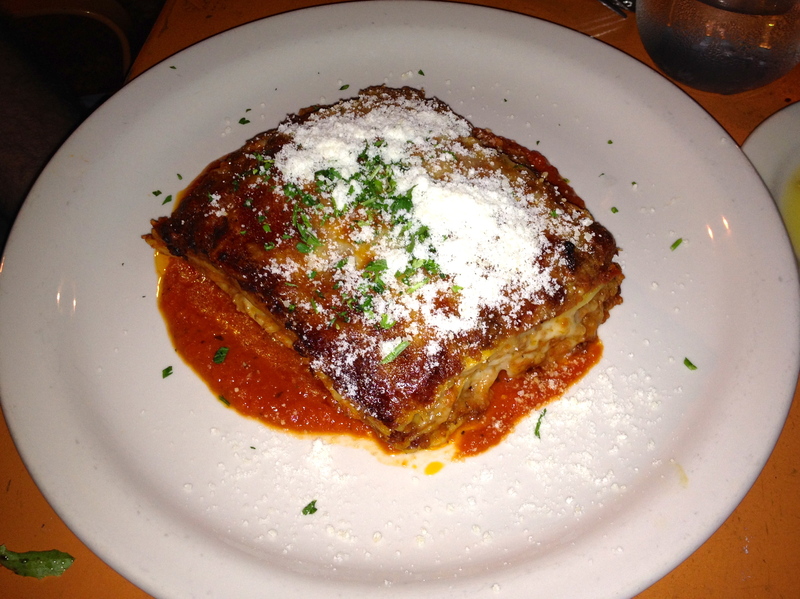 The bottom line on Osteria del Figo: Combined with a visit to Monday Night, our dates don’t get much better than this. Figo now has seven locations in Atlanta, and there is probably one near you. 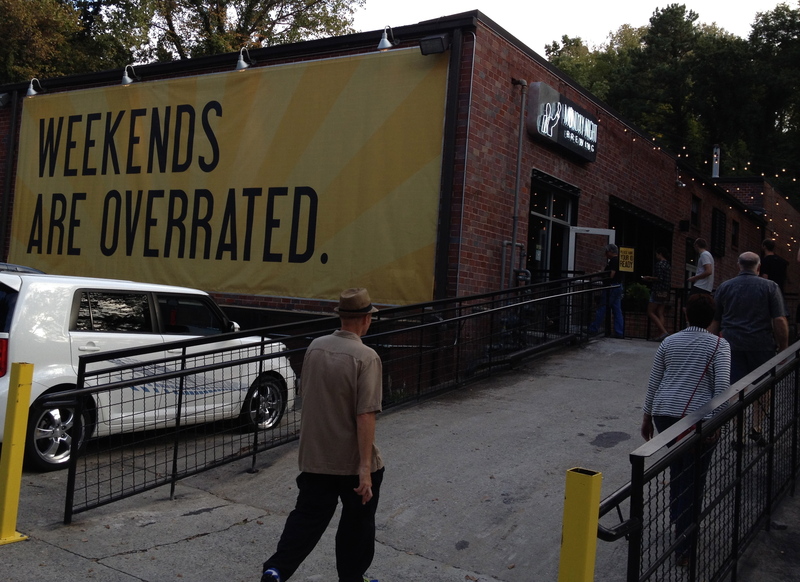 They are celebrating ten years in Atlanta, so you know they are doing something right. For fresh pasta that is reasonably priced, it’s good to go to Figo.